The 2019 Chevrolet Silverado 1500 and 2019 GMC Sierra 1500 are more capable trucks than their predecessors, but their capability came in the name of fuel economy. Automotive News (subscription required) reported last Friday that both trucks with the 4.3-liter and 5.3-liter engines return worse fuel economy than their predecessors. The 2019 Silverado with the 4.3-liter V6 engine will return 16 mpg city, 21 mpg highway, and 17 mpg combined with a two-wheel drive truck, and 15/20/17 when paired with four-wheel drive. Those figures are down 3 mpg from 18/24/20 from a 2018 Silverado with the V6 engine and two-wheel drive, and down 2 mpg from a four-wheel drive truck, which returned 17/22/19 in the 2018 model year. The 5.3-liter V8 engine returns an identical 17 mpg combined for the 2019 model year with four-wheel drive, down 1 mpg compared to the 2018 Silverado. 2019 Silverados with the 5.3-liter V8 will return 15/20/17 compared to 16/20/18 for last year’s truck. The new 2019 Silverado Trail Boss models suffer even more with their off-road equipment. Both engines return fuel economy estimates of 14/18/16 with four-wheel drive. We took a deeper dive into why the truck’s fuel economy numbers barely moved—or in the case dropped—back in September. It comes down to drag coefficient of an area (a multiplication of the drag coefficient value by the surface area). 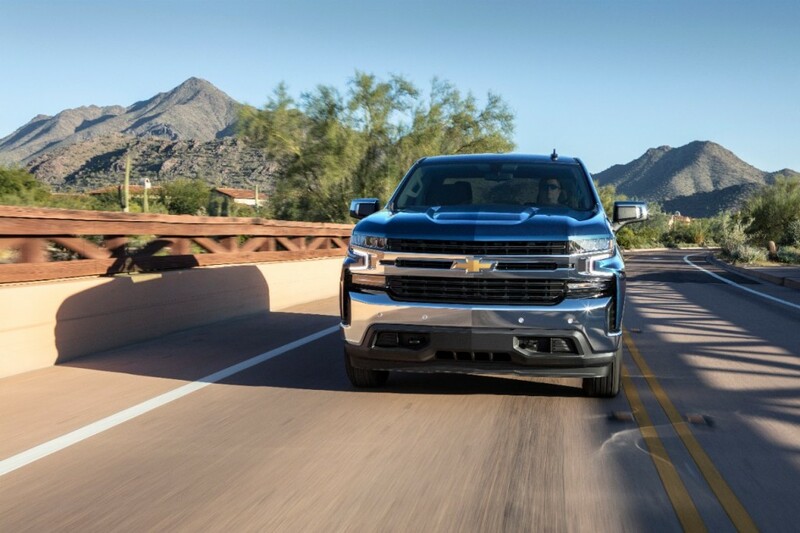 While aerodynamic efficiency increased by 7 percent in the 2019 Silverado and 2019 Sierra, the drag coefficient of an area worsened with the redesign. Basically, both trucks have a large hole they need to punch through the air. This creates more resistance as the trucks move at speed, which requires more energy to keep the moving. And that means they’re using more gasoline. The same fuel economy story is present for both trucks’ new 2.3-liter turbocharged four-cylinder engine, too. Despite its dainty displacement, the engine only returns 20/23/21, which falls short of Ford and Ram’s larger, volume-selling engines. Didnt chevy announce that EPA window stickers would be model specific, so these number *could* be for the Custom TrailBoss trim. Which if that is the case makes sense why a 2018 with same engine would appear to get better mileage. A lift, even a small one, and Duratracs would hit the MPGs. Though if that isn’t the case, and the Trailboss is expected to get even worse MPG, well then that’s not good! How did project managers allow this to happen? Millions of dollars were spent on weight reduction and engine fuel management tech to improve mileage, only to have it all thrown out the window because of the wind resistance caused by their front end design. As if the other evaluation category loses for this truck vs. the competition weren’t enough, now GM looses in mileage too. Unacceptable. GM you are capable of better. The front end is so huge on these and the downward frontal visibility looks like it will be awful. I can guarantee that I can see an object on the ground in front of the truck at least 3 feet closer in my 2005 3500(!!!) GMC than in the new HALF TON trucks. There was a change in how mpg was calculated in 2017. A lit of vehicles have seen a drop in fuel economy. The Camaro was refreshed and the manual one (no hardware changed) saw a mpg drop. Auto didn’t, but people blamed the 10 speed for not being great. So part is due to the bigger vehicle that’s more aerodynamic, part due to the EPA changing the testing procedure. GM engineers are not responsible for the drop from the 18 to 19 models. Obviously the mpg will drop for Trailboss models though. I saw at least a 2mpg drop maybe more on my k2xx 5.3 when I did Duratracs and a 1.5″ lift. Besides being ugly they cost more to run? I dont know what’s going on with GM. The new 2500 looks horrendous, and these 1500 arent far behind. The current generation didnt look to bad, and the 5.3 engine is a work horse. Not to mention the smaller fuel tank. I’m waiting for the 2500HD to come out with a 15 gallon tank! I cant wait to stop for fuel every day! Withholding further comments on GM and the person trying to create a headline. I hope this helps clear some things up. The question I have is how does it compare to the competition? I’m not buying the EPA’s mileage ratings on the 4.3 engine for one minute. There is no way a slightly larger frontal area is making an engine lose 3 MPG on a new more aerodynamic lighter truck. It’s also funny how actual owners are achieving less real world MPG on the Ford EB engines and Ram’s eTorque setups yet that doesn’t reflect in the window sticker. My buddy has rented numerous 3.5 EB equipped F-150’s and Expeditions and they struggle mightily to get anywhere near the highway and combined ratings unless you treat the gas pedal like an egg shell. Also if the 2017 EPA ratings calculation was changed why did so many of the F-150 models go up in ratings with the same basic truck with no weight loss and a mere switch to the 10 speed on all but the base V6? What magic are they employing here. I can’t wait for real world test results. My dad dad has never struggled to hit the highway EPA rating with his 2013 F-150 Ecoboost, stop making excuses for GM. The new Trucks get around the same mpg as the competition from Ford and Ram, yet have a lot less power (when comparing volume engines). I’ve been a GM fan my whole life, but I’m certainly not loyal to the brand so unless there’s a significant update in the next few years my next Truck will be an F-150. Hey buddy, When some lady hit our Yukon XL 2 years ago, we were given a 2017 Suburban as a rental. It got damn close (19) to the MPG ratings. After 2 weeks the brakes started to squeal and it was getting close to needing an oil change so they gave us an Expedition of the same year. While it was the older model, it still only got 14.6 mpg in the same scenarios. Our 1996 C2500 with the 5.7L got much better MPG (12.7) with a utility bed (more weight) than our 2014 F250 6.2L (8.7). If your expedition had the 5.4L V8, that would be a world of difference from today’s motors. The new trucks are a LOT taller and wider, with huge grilles that punch a much larger hole in the air. It’s this insane desire to make pickups look like semi trucks that is causing the loss of fuel mileage. My question is this: Could the launch of these new,”ground breaking” trucks from GM get any worse? And does Mary continue to get a pass because……….??? What???? How does any of this translate to long term sustainability? It’s looking like another short life cycle for a non-competitive product. I am a loyal gm owner, but this looks like the beginning of a company wide public relations and ultimately company wide death spiral. Mary Barra is trying to stick it to Trump by closing factories, meanwhile her mismanagement is causing yet more loss in market share,!now the golden goose is undercooked with an already pissed dinner party. Owner who will buy Toyota in the Future. So you complain about no improvement to gas milage and claim you will switch to a truck that is worse in class for fuel consumption? The Toyota 5.7 is not close to a copy of GM 350, as it has dohc not pushrods. That negates anything else you have said cause you clearly know nothing about either truck. I know enough that I can judge between a truck that gets 22mpg in 4×4 compared to a truck that get 17mpg in 4×4 configuration. And the 5.7 is directly based off the 350. Same bore and stroke, same crankshaft size and layout, block same layout. Yes they changed the headers and injectors, so about 25% of the engine. Good luck trying to find a Silverado rated at 11500. The vast majority are rated at 9000. Also, if you want that 11500 lb rating with the 5.3 you’re stuck with a single speed transfer case. The Tundra wouldn’t be my first choice, but I’d take it over these new Silverados. Heck, I get 17+ combined on my 2003 Silverado Z71. I guess I will just have to wait for something better, maybe one of these plug-in pickups will be able to give me comparable truck utility but with lower operating costs. Swing and a miss! Well done, GM. Has GM learned anything from the Camaro? People like visibility in their vehicles. Why not improve visibility and have a smaller frontal area?… Two birds with one stone? I know people would make fun no matter the design is, but may as well try to be *more aerodynamic than Ford/Ram rather than less etc………. That’s kind of bad news. I hate to say it, but the Ram is looking better and better. Hmm…Uglier, more expensive to drive and my truck payment would exceed my house payment. Makes me want to run right out and get one. Seems like GM wasn’t happy with second place. So they set their sights on third or fourth. Any good news from GM? The wheels are still round. Truck trend and car and driver, did real world testing on ram 5.7 e-torque , and silveraldo 5.3 and 6.2 also GMC Sierra . Both gm products out due real world testing empty and loaded . Also check out tfltruck trail boss gets over 2 mpgs than ram rebel with e-torque . On a 800 mile round trip . Still with the “frontal area” argument again. Why don’t you wait until the real world numbers are out before repeating that stuff. Obviously the MPG calculations are off, because why would a LIGHTER, more aerodynamic truck with the 4.3 V6 get THREE MPG worse than the outgoing truck? Obviously there was an error. Quit putting up clickbait headlines before the real world numbers are out. And quit feeding the troll GM haters. Every single GM truck always beats its EPA ratings. ALWAYS.